AMAZING PULL #2!!!! OMG!!! I can't BELIEVE IT! 2010 Allen & Ginter Stephen Strasburg AUTOGRAPH Redemption CARD! It's time for The Dimwit to act like a 12 year old girl.... OMG OMG OMG OMG OMG OMG OMG OMG OMG OMG OMG OMG OMG OMG!!!! He just pulled a redemption card for a Stephen Strasburg AUTOGRAPH card! Rumor is there are only 10 of these and the first one sold on ebay for $3,250!!!!! Holy crap Batman! If you don't think that the Dimwit hasn't already posted this on ebay, you're nuts! Can't believe it... 2 boxes and 2 awesome cards!!!! SWEET!!!!! NEED A BUYER!!!! HAHAHA!!! 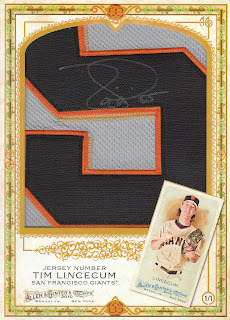 2010 Allen and Ginter Tim Lincecum Cabinet Loader Autographed Relic Baseball Card - AMAZING PULL!! !